Other potters visiting our workshop have often shared their ideas with us, as we have with them. This is easier to do if the information is already set up as a computer print-out, like the pdf documents available on this page.. If you have similar good ideas of your own, we'd like to hear them too. This is a re-working of the traditional Brongniart's formula, which deals with the amount of dry matter suspended in a glaze or slip. Useful when you want to add percentage amounts of another ingredient to an already-existing glaze. Written out originally as a submission to the magazine "Pottery Making Illustrated". Another article written originally for "Pottery Making Illustrated", a bit more detailed than the version eventually printed. A do-it-yourself version of an expensive oxy-probe, built for just a few dollars using an exhaust gas oxygen sensor from a car engine. After using one for over a hundred firings in a gas kiln, it's hard to imagine going back to the old days when reduction was judged by the presence of smoke and flames. Photographs and measurements made during the construction of two successful home-made pugmills. A good place to start if you're thinking of making one too. A much larger file this one, 25 pages of practical ideas about applying glazes with a spray gun. 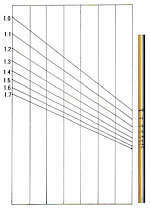 Instructions for making a floating-straw hydrometer, to measure the specific gravity of a glaze. Useful if you mix your own glazes, and want reproducible results every time. This is the draft of an article originally prepared for Pottery Making Illustrated, and eventually published in Sep/Oct 2013 under the title "Stayput Stencils". As always, the text had to be edited and the images re-arranged to suit the magazine layout, so the original draft contains more information than the published version. Another article prepared for Pottery Making Illustrated, this one published in Nov/Dec 2015. 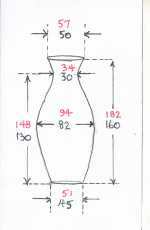 A quick, simple method for calculating the "wet" dimensions required, to allow for shrinkage when making a copy of an existing pot.